How is a national hero created? These are semi-mythical figures whose names are imprinted in the national consciousness and apparently survive changing tastes and political currents quite effortlessly. 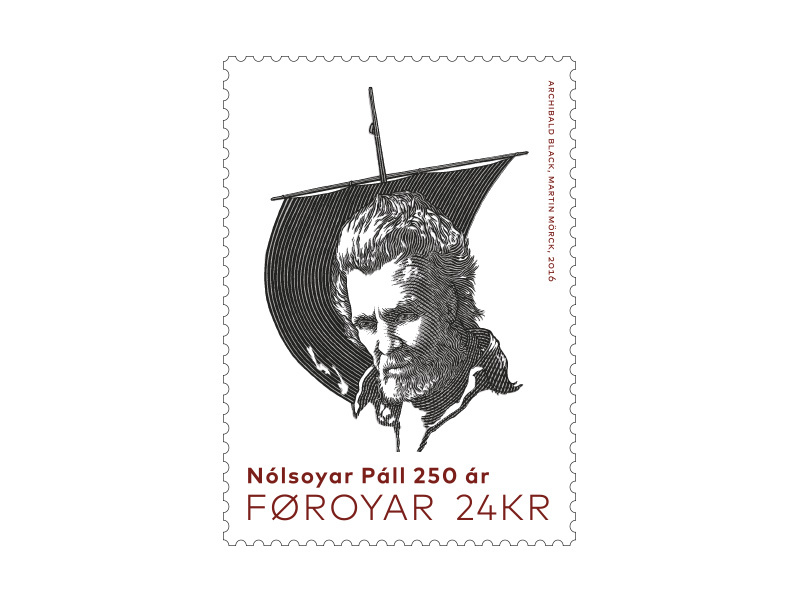 If you ask a Faroese whom he considers to be the national hero of our small island nation, the answer will almost certainly be: Nólsoyar Páll. And the reason is like winning the lottery - he was the right man at the right time, intelligent, combative and stubborn - along with the paradoxical fact that his worldview, ideas and behaviour were completely and utterly Unfaroese - at least in the eyes of his contemporaries. Poul Poulsen Nolsøe was born in 1766. In the following year a Copenhagen merchant, Niels Ryberg, built a transit warehouse in Torshavn to avoid trade restrictions imposed because of the American Revolution and the war between England and France. Ryberg‘s trade opened the door to the outside world in a society that had largely remained stagnant since the Middle Ages, dominated by monopolistic trade practices which severely affected growth and development in the country. In a twenty-year period ships arrived in the Faroes from all corners of the world and this was bound to make its mark on the population. It suddenly became possible to be concerned with things other than mere subsistence agriculture, coastal fishing and the hunting of birds and pilot whales. It was in this time of prosperity that Poul Nolsøe grew up. He received good education, studied navigation and eventually became a seaman. 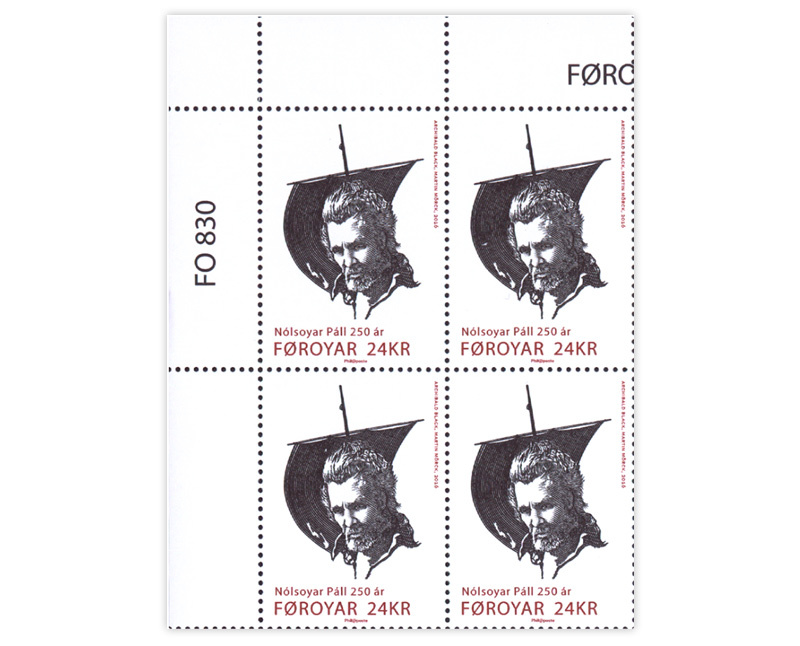 After a few years of sailing on the route between the Faroe Islands and Denmark, he went ahead and sailed across the seas for some years, serving for instance as an officer on Danish and American ships. In 1798 Nolsøe appeared again as a mate, and later captain, on monopoly vessels. He got married and had a daughter, but his young wife died just a few years later. The following year he married again and settled down as a farmer in Biskupsstøð, in what is now the town of Klaksvík. At that time, the Ryberg era was over and the Faroe Islands were slowly descending into the pre-1767 condition. It goes without saying that an active and well-travelled man like Poul Nolsøe found it hard to adapt to the sluggish way of life as a farmer in a stagnant society. He quickly joined the company of like-minded people who wanted free trade, free access to foreign market, free enterprise and community growth. Together with two of his companions, Nolsøe wanted to purchase a vessel for freight and fishing. They were, however, unable to obtain loans for the purchase, so instead in 1804 they bought the wreck of a ship that had run aground at Hvalba in Suðuroy. Travels and Struggle with Officialdom. 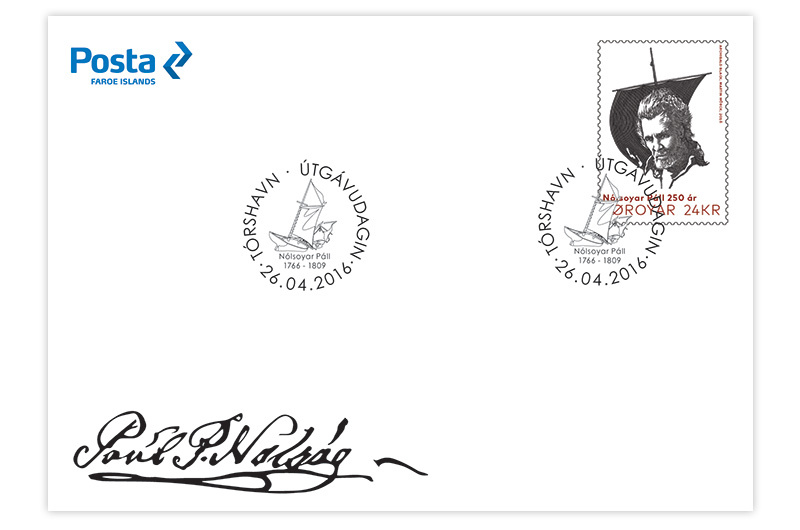 The launching of Royndin Fríða proved to be the inception of a bitter and turbulent dispute between Poul Nolsøe and his like-minded compatriots on one hand and government officials on the other. The Royal Trade Monopoly enjoyed exclusive rights to import indispensable items as well as the rights to export goods specified in the tariff list. In 1805 Poul Nolsøe made two trips with Royndin Fríða, the first to Bergen carrying Faroese coal and the other to Copenhagen, also with a coal cargo. Due to the import restrictions they did not bring any cargo back to the Faroes. At the end of spring fishing season the following year Nolsøe went on an actual trading trip. He would bring woollen sweaters, dried fish and cod-liver oil since these goods were not covered by the tariff list. Officials in Torshavn dispatched a letter of protest to the Danish authorities – forbidding him to bring any goods back home. Nolsøe protested and sought permission to bring freight home for his own account. He received a partial promise to do this, but time dragged on and he was in a hurry to return home for the summer fishing season. Finally he refused to wait any longer. He bought goods, declared them as freight to Kristiansand in Norway and set out to sea. The Danish authorities realized that he had provided wrong information and a message was dispatched to the Faroe Islands to the effect that the cargo of Royndin Fríða should be seized and Nolsøe brought before a court of law. This was the beginning of a bizarre and protracted litigation. It was difficult for the officials to appear convincing, since they themselves were involved in various semi-corrupt side affairs - and moreover were unable to prove that Nolsøe was a smuggler. He himself claimed that the goods had been transferred to a Swedish vessel on the open sea. In the end Nolsøe was convicted of breaking quarantine rules. He was fined 735 dollars for selling goods on the high seas but acquitted of black market trading. The authorities had not heard the last from Poul Nolsøe. He was an excellent poet – and in the winter of 1806-07 he wrote the brilliant libellous verse “Fuglakvæðið” (Poem of Birds) where he exposes his opponents, the officials, as rapacious birds of prey terrorizing and exploiting the country’s peaceful bird population. In June 1807 Poul Nolsøe sailed back to Copenhagen with a delegation wishing to apply for a trial period of free trade, negotiate fairer prices and more advantageous terms and conditions. These were troubled times. The war between France and England had entered a new phase and Denmark’s neutrality was threatened. Crown Prince Frederik (later Frederik VI) who ruled on behalf of his insane father was staying in Kiel in Holstein. The four Faroese delegates travelled to Kiel to submit their petition. Crown Prince Frederik was much more accommodating than the treasury and the chancellery of commerce. He ordered that the seized goods be returned and the ship provided with freight to bring back home to the Faroes. Things looked promising for Poul Nolsøe and his delegation, but time dragged on. The crisis between Denmark and England deteriorated. In July the British sent a large naval and invasion force into the Baltic Sea to force Denmark to surrender its fleet which the British feared would end up in the hands of Napoleon. Despite intense negotiations, England sent forces ashore, besieged Copenhagen and bombarded the city until it surrendered and turned in all of the country’s naval ships. This humiliating treatment resulted in Denmark siding with the French in the war which would have disastrous consequences for the Faroe Islands. After the surrender, Nolsøe sought permission from the British admiral to sail back to the Faroe Islands with a cargo of grain. Royndin Fríða came back home in early October and the grain was unloaded in Suðuroy. Nine months passed until the next ship arrived with grain supplies. Conditions deteriorated in the Faroe Islands, pirates ravaged the islands, pursuing cargo ships from Denmark. Despite the obvious hardships, Governor Løbner would not allow Royndin Fríða to sail with cargo. Instead he wanted Poul Nolsøe to sail to Norway or Denmark bringing intelligence from the Faroes. During the first half of 1808, two English pirates caused havoc in the Faroe Islands and Governor Løbner had to surrender the garrison without striking a blow. The buildings on Skansin in Tórshavn were burned down and the monopoly warehouses looted. The imminent danger of starvation persuaded Poul Nolsøe to take matters into his own hands. In late June he sailed to Copenhagen to pick up grain supplies. 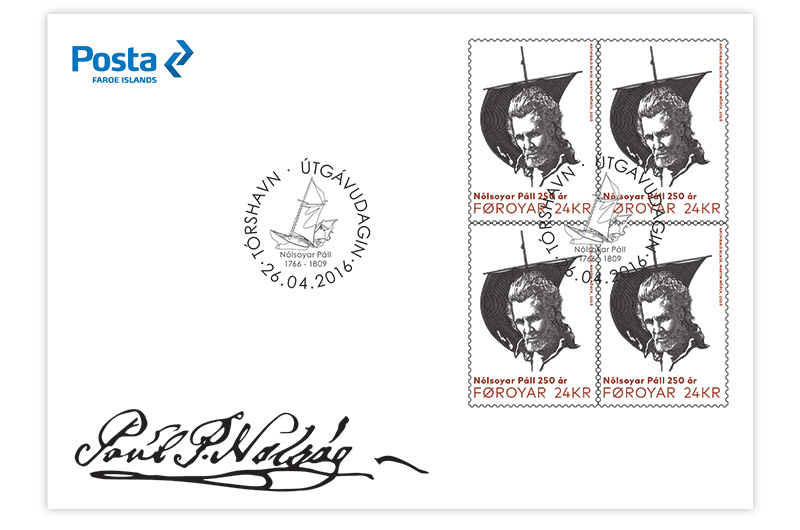 But Royndin Fríða was seized in the strait of Skagerrak and the crew was brought to Gothenburg in Sweden. The ship had reportedly suffered severe damage and was no longer seaworthy. In spite of everything, Nolsøe succeeded in getting in touch with two British admirals and inform them about the conditions in the Faroe Islands. The Faroese crew was therefore brought to London to explain the unintended consequences. With the help of the Danish consul in London, Nolsøe established contact with the British authorities and made clear to them how bad things were in the Faroe Islands due to the British blockade and the rampage of the pirates. Both the Privy Council and the Department of Commerce were sympathetic. As a substitute for Royndin Fríða Poul Nolsøe was equipped with a new ship, the North Star, and relief supplies for the population of the Faroe Islands. In December 1808 or January 1809, the North Star sailed from England with supplies but never reached the Faroes. The ship was probably wrecked in a hurricane sweeping the British Isles at that time. 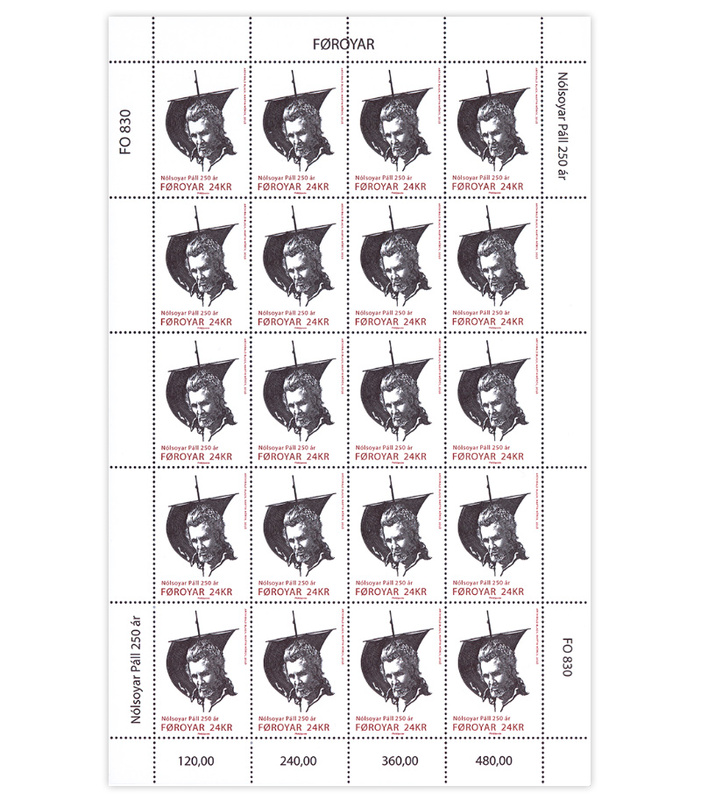 Nolsøe’s bitter conflict with an obdurate officialdom and his attempts to alleviate the hardships of his countrymen created the martyr and national hero, Nólsoyar Páll. The title is by no means undeserved - he was an exceptional man of vision and courage, equipped with the will to accomplish his mission despite ferocious opposition.